If you’re feeling stressed out and sore, simply lie back and let this home acupuncture mat ease away all those negative feelings. Release the toxins and tensions that build up in your body during a stressful day, and enjoy a feeling of head-to-toe wellbeing and warmth. This is an acupuncture mat made with only non-toxic, and non-allergic materials, so you can rest assured its safe as well. Start by using your mat for five minutes a day, to boost your circulation and digestion, and soothe aches and pains. With the innovative energy mat, you can experience the benefits of acupuncture, acupressure and reflexology in the privacy of your own home. 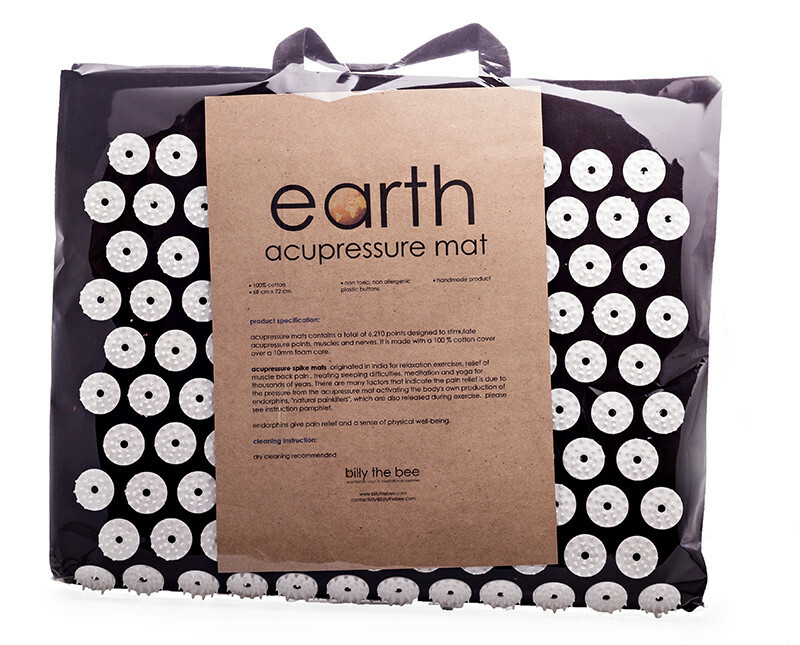 The acupressure points on the mat stimulate the release of endorphins and oxytocin. These are your body’s “feel good” chemicals, typically released during exercise. With more endorphins and oxytocin flowing, you’ll enjoy a feeling of relaxation and wellbeing, finding it easier to fall asleep. Use of the Acupuncture Energy Mat is not recommended for those with skin conditions. Pregnant women should consult their health care practitioner before using the Acupuncture Energy Mat. This information is meant to supplement but not to replace advice from your doctor or health care provider. The acupuncture energy mat can be used lying down or sitting. You can use it while watching TV, reading a book, or simply winding down before going to bed. You may experience some minor discomfort with the first few uses of your mat; after 3-5 minutes your body should adjust. We recommend placing a towel over the mat when you first start using it, and removing it as you gradually get use to the sensation of the spikes. Try to stay on the mat for at least 10 minutes the first few times. As you become used to the sensation, slowly increase your time by 5 minutes per use, until you reach the ideal session time of 30-40 minutes. Wow, this is possibly one of my favorite meditation tools yet. I don't remember the last time I was so pleased by a purchase. I very much recommend this energy mat. What a spoil. What a lovely Christmas gift I got from my husband. He uses it as much as I do. I have used it on solid flooring but need a shirt for now, I have also tried it on my bed after a nice hot shower and passed out on it. It's great and my mother has even borrowed it, being more fragile and in alot of pain she tried it on a bed and has borrowed it again so I must be making her feel good too. Fantastic, just buy it already! At first you will feel like a bit of a masochist but if you bear with the pain for the first 3 minutes your whole back will warm up and blissfully release all muscular tension. I was incredibly skeptical but this mat really works well! We use this mat daily. Such an investment. Amazing, this product is life changing. Releases stress and tension. I bought one for myself. Hubby claimed it as his own. Now we each have our own and the acupressure pillow to share. My mom also has one and she is in love. Its the best travel companion and you feel great after using it even for five minutes! Bought this mat for my husband as he often has a stiff back, first night he used it for 15mins, he slept so deeply he's no longer a skeptic. He wears a t-shirt as it's too sharp for him. I find it bearable and can use it on my bare back for an hour - great sleep and loosens up my back! As a chronic insomniac I find this mat to be a little miracle. The 1st time I used it I fell asleep on it, which was not such a great idea as it left the skin on my back feeling me quite "tender". (now I set an alarm, just in case). I have been using it every night before I go to bed and it relaxes me to such an extent that I fall asleep easier & have better quality sleep than I have ever had. Love my mat. Husband also uses it. After a long day of work, cooking, cleaning and sorting everything for the next day, having a shower then using my mat, best feeling! 10-20 mins on this mat relieves muscle stiffness or post workout soreness or any muscle/bone pain. My 90 year old gran with arthritis finds relief after laying on it. My mom and 8 year old niece are also obsessed. Provides relief and invokes relaxation. Beyond impressed by this mat, its easy to carry around and used and relieves any aches and pains almost immediately! Absolutely love this mat! Was not expecting for it to be as effective as it is. Worked its magic from the first time I used it; been suffering from terrible neck and shoulder pain due to strength training. This mat relieved ALL tension and gave me an awesome nights rest. Highly recommend it. Just bear with the prickly sensation your first time, after a while it's not noticeable. 10/10 would endure pain again! Wheeeewwwwwww! This one hurts!!! But after exercise, before bed, any time your brain needs to wake up a bit, this is an excellent way to get your body relaxed and your mind away from the 10000 thoughts-a-second train. After you get through the first 10 minutes it's a breeze! This really helped me with my back pain and stress. So glad I found this! Temporary relief, but worth it for daily relief. I've been using it for a week or so for chronic shoulder pain. I don't have a lot of time to spend 30 minutes lying on it, but I do my savasana over it after yoga every day. I have to say that the pain in my shoulder and thoracic area does experience relief for a while after each short session of 5 to 10 minutes. So I really do recommend this mat to people with similar issues. If I spend more time on it, perhaps the result will be longer lasting. This one for my son. So far, mine's been in use for over a month now and I can feel the benefits. Thank you FTN for finding healthy alternatives. After a youth being indestructible, my lower back complains daily and at times, very loudly. I was sceptical about this but its cheaper than the prescribed meds and much healthier so I am trying it. From a 10 minute session every morning, it allows me a full day with pain. It is not a cure. That said, I am a great believer that if I give my body that best chance, it will heal itself. Looking forward to this. This product was suggested to us and it is lovely! The design is also so cute with the way it folds up into a carry bag. It's surprisingly not painful and besides the relief also such an intensely sensational experience! We have purchased 2 of these mats for our family. Their use is beneficial in relieving my son's back pain, and I just love the relaxing effect. Excellent value! I bought this Acupuncture mat for my husband who sometimes struggles with back pain due to stress and being infront of a work-desk all day. We both use it daily and my husband has not had any back pain since. Best used before bedtime to help relax the muscles and ease away stress. Also great for tired feet: just sit down on a chair and put your feet up onto the mat for a few minutes, it works wonders! My whole family love it! I was given this as a gift to help with my fibromyalgia. It certainly has. But I have since had to buy another one. My husband wants to use it all the time to help with his migraines and general discomfort from the onset of Parkinsons and my children use it for reflexology. Everyone wants a go every night in front of the TV. A really great product whether you are using it for pain relief or to relax.